West Shore by Sunnyside Resort. 10 min to the lake and surrounded by hiking. 6 bedroom, 3 bath, Hot tub, Pool Table, Sauna, Fireplace, 7 TV's Wrap around deck with magnificent views, of Twin Peaks and 3 miles to the beaches at Lake Tahoe. Located in Tahoe City less than 1/2 mile to Sherwood lift at Alpine Meadows. Short walk to the lift and can ski home. You can also use the homeowners parking lot right at the lift. Spectator? that works too. There is a warming hut that serves coffees, beer and bbq at the lift. Spectating the skiers is a nice way to spend the day if you don't ski. Bedroom 2. Queen with TV, bathroom. This six bedroom, three bath, three-story chalet is the perfect getaway for both winter and summer. Located in Tahoe City, walking distance to the backside of Alpine Meadows Ski Area, at the Sherwood Lift high speed quad chair, you can walk there and ski home. No crowds, no lift lines, no hassles. When the snow melts, the surroundings become a playground to hike, bike, and fish. Tennis lovers can enjoy the homeowner tennis and pickleball court, golf lovers can enjoy the multitude of golf courses within a ten mile radius, beaches and picnic areas are within biking distance to the house. There are a ton of hiking trails just out the back door, and a great fishing creek just down the street from the home. The activities in the Tahoe Basin are endless. Located on the West shore of Tahoe City, you are minutes to the Lake and restaurants, and close to Chambers Landing and Meeks Bay with great sandy beaches, BBQ grills, incredible views, and a day full of bliss. The house is chalet-style and has an open floor plan that can accommodate your family and friends well. The 22 foot cathedral ceilings, and floor to ceiling windows, with expansive wrap around deck offer a great house to enjoy the spectacular views from. With 2 sliding glass doors, the sunny deck becomes an extension of the great room with lots of patio furniture, BBQ, and privacy. There is a large 2 car garage with extra parking, and 40 foot enclosed walkway for easy access to your cars in the wintertime. As you walk in the front door, you are greeted by a Spanish tile hallway leading to 3 bedrooms. There are 2 bedrooms with queen beds, each with a TV, sliding glass door that exits out to a deck. Here you can enjoy a hot tub with the views of Twin Peaks. In the wintertime, you can watch skiers short cut home from Alpine Meadows through the front yard, and in the summertime you can watch squirrels climb the trees. Down the hall is laundry home, full bath, sauna area and another bedroom with queen bed,TV and twin. The sauna is the size of one you'd have a gym: 2 levels with enough room to spread out in. Next to the sauna is a changing area and with a 'Finnish' touch. Cool off in the shower room with four shower heads and glass atrium that looks out into the forest. It's a great way to end a non stop day. The changing area is also connected to a full bathroom. There are bathrobes some in bedrooms and changing area for your use during your stay here. The second level is the Great Room and that it is. With 22 foot cathedral ceilings with floor to ceiling windows you won't be able to keep your eyes off the beautiful views of Twin Peaks . Bring your binoculars to view the occasional extreme skiers who will snow mobile up the mountain range and ski down, and the incredible sights of wildlife year around. Two sliding glass doors exit out to a sunny wrap around deck with a barbecue, and patio furniture which is used in summer and winter. This level has the kitchen, living area and dining area all looking out to the views. The granite countertop kitchen is fully stocked and overlooks the living and dining area. The living area has a leather sectional and faces a large stone fireplace and 55" HDTV. The crackling sound of wood burning is a treat. The dining area is 1/2 nook with pillows, bench and chairs. You can eat here, or relax here. It all faces an entertainment center with TV. DVD, stereo, and some games. From all areas in the main area, you can watch TV, enjoy the fireplace and views, or socialize with the rest of your group. Off the living area is another full bath attached to a bedroom with queen bed and TV. Next to that room is the Master Bedroom. There is a King-size sleigh bed with TV, half bath off a changing area, and walk in closet. Indirect lighting and views of the forest make this room a bonus. Up the stairs from the living area, is a loft with pool table, TV, and two twin beds. The loft is private from downstairs and you can play pool during the day, and use the room for sleeping at night. Kids love it here. Because Lake Tahoe's motto is just 'play hard' extra attention has been given to a great bed and a good nights sleep. All the bedding is Hotel Style with memory foam mattress pad, luxury 300 count sheets, 4 down or down alternative pillows, duvet, and bed throw. You'll feel like you're in an upscale hotel. There is wireless internet, 7 TV's on DISH 3 DVD players, washer and dryer, as well as upgraded towels, and extra niceties to make your stay enjoyable. When you arrive at the house, all beds are made, towels hung, and coffee service is provided for your first morning. The furnishings are user friendly with plenty of seating for your family and friends. 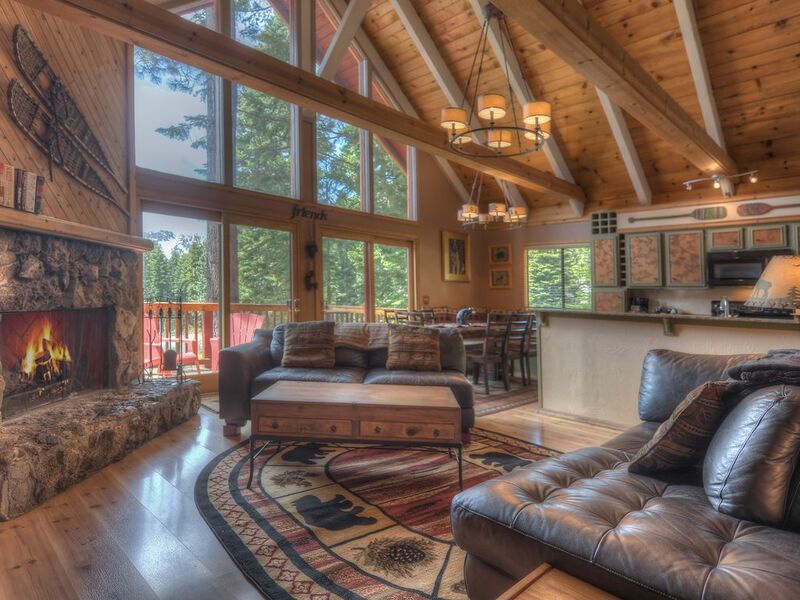 High ceilings with large wooden beams, triangle shaped windows, and mountain decor compliment the 'Tahoe' feeling. The location and amenities of this home makes this a great vacation home year-round. I've been renting out my homes for 20 years and have much experience accommodating my guests. I'm hands on with my guests and available 24/7 for any needs you may have staying at my house. Please feel free to call me before or during your stay with any questions you may have. The house is centrally located on the West Shore of Lake Tahoe, close to all.Lake Tahoe is unparalleled to any other destination I've been to in the world. The skiing in the wintertime is suburb, the beaches at the Lake in the summertime is liked being in Hawaii. White sand and crystal blue water. The weather is perfect and conducive to doing anything you want outdoors, year-around..
How about walking distance to Alpine Meadows? Thats probably the most unique thing about the house because there isn't many homes on the North Shore of Lake Tahoe that are. When I stay here, if I'm on my computer during the day, I'll take a break, walk to the lifts, ski to front side for lunch, and ski back to my front door. Days I want to drive to lot, homeowners and their guests have access to a private parking lot right across the street from the Sherwood lift. There is also a warming hut by the lift that serves BBQ, hot chocolate, coffee beer, etc and lots of chairs. I like both seasons. The skiing speaks for itself, but in the summertime there are tons on trails to explore around the house. Page Meadows is a popular trail system located a block away. The house is just up from the Lake at Sunnyside Resort which has a great restaurant with huge deck on piers right on the lake. You can spend all day here watching the wooden boats come in for a beverage or dining. You can access the bike path here and ride to River Ranch which is a beautiful ride along the Truckee River. Once you get to River Ranch, you can enjoy another great deck for dining while watching the river rafters come in. Rafting is a fun thing to do also. Tahoe City has lots of restaurants and shops to enjoy. There is always something going on there to add to a weekend. Even though there are tons of things to visit in Lake Tahoe, I totally enjoyed just hanging out in the house and on the deck. You really feel away from it all, but are close to everything. Plus...the views from this house are incredible. 1st level: Bathroom with toilet, tub, shower. Also Large shower in atrium with 4 shower heads. 2nd level: Bathroom with toilet, shower. Also 1/2 bath with dbl sink and toilet in Master bedroom. Million $$ views from the Great Room and wrap around deck. In the wintertime, there is usually enough snow to ski on the side the road home. Upgraded linens with 4 pillows on each bed with memory foam toppers. Bathrobes and slippers are provided to make your stay cozy. Everything you'll need for your stay. Large dining table with wrap around seating. There is also a card table in closet with 4 seats for extra guests. 1 tennis court, 1 pickle ball court. large sauna with shower atrium. New hot tub on Deck with great views of the mountains. We had a great time staying at Twin Peaks. The house is definitely smaller than the pictures portray, and the significant amount of stairs got old pretty quick, however the house had an eclectic charm we all enjoyed. There were 9 of us and plenty of room to sleep (a few of us bunked together). There was an unfortunate smell coming from the sink in the kitchen (garbage disposal?) and one of the shower's water pressure fluctuated significantly. Yet, all in all, we really enjoyed our stay. The house felt secluded within the woods and it was conveniently located close to town. Took my daughter and her friends for a birthday getaway. They loved the hot tub and close location to the slopes and the village in Tahoe City. We really enjoyed all the amenities and it was an Ideal place to celebrate her birthday! We were impressed with this beautiful property. My only complaint is we didn't stay long enough. The property was very clean. The kitchen was well equipped and had all the amenities. We cooked a big family meal and everything we needed was there. All the beds were very comfortable. We weren't able to take advantage of the outside because everything was covered in snow, but I think this would be a great place to stay in the summer. We had a ski weekend at Lake Tahoe and it was perfect! We will definitely be coming back in the future. The house allowed all of our guests to have enough room to spread out and have some privacy. Loved being able to walk to the ski lift. The house was great, hot tub used nightly and other amenities appreciated! We stayed here in January 2019 for our annual family ski trip. We had a group of 11 adults (3 couples, 5 singles) The bedding arrangements worked out fine. The house was well stocked with kitchen stuff. Upon checkin, the thermostat was broken, but we called the owner and she sent someone over right away and it was fixed within 2 hours. The Sherwood lift was right down the street and there is parking with a permit the owner provided; this was very convenient. The living room looks bigger in the picture online, but we made it work. The pool table in the loft did not get used because there isn't any room up there with the two twin beds. It should either be an game room or a bedroom, not both. The bathrooms were suitable for all of us, but they will need to be updated at some point, in our opinion. The hot tub and sauna were great additions, we used both without issue. We enjoyed our stay, the house is in a great location! I’m glad you enjoyed the house and its proximity to the Sherwood Lift at Alpine Meadows. The homeowners of Alpine Peaks have privileges including a private parking lot, and access to the Sherwood high speed lift chair . You can ski to all the runs from here, including skiing to the lodge for lunch. I have a 24/7 maintenance service and the thermostat was replaced upon your call. The pool table is in the loft area and is typically enough room and enjoyed for play by all. Bathrooms were remodeled a few years ago. The hot tub has views while soaking in it, and the sauna is a great spot for after skiing. I hope your family will come back for a future trip. Awesome house! Gorgeous views! The property was exactly as described. The rooms were clean, Jacuzzi worked great, and the lay out made for a comfortable experience for all guests. The location is close to everything (especially Alpine Meadows which couldn't have been better ) but gives you a secluded, mountain feel. I look forward to staying here again in the future and a big thank you to Sandy for the great communication! Located in one of the most desired neighborhoods on the North Shore, you are walking distance to the back side of Alpine Meadows with privileges. There is a private parking pass that will allow you to park right at the Sherwood lift, a quad high speed chair, and get on! Alpine Meadows allows the homeowners living in this neighborhood and/or guests to start here without at ticket and ski to the front side to purchase it. And, the homeowners have their own snow grader which purposely leaves enough snow along the roads so you can ski home if you want to leave your group. Don't ski? Enjoy the hut at the lift for morning coffee, lunch, or just watching all the activity on the hill. In the summertime, the cat tracks become a playground for mountain biking and hiking. Endless trails with Lake views and wildflowers will keep you entertained. The snow melts into Ward Creek which is easily accessed from the house, known for its trout fishing. Tennis? yep...1 homeowner tennis court are here for your use. Ward Valley is known for its peaceful setting of houses divided by forest land and views that are breathless. Just up from the Lake at Sunnyside Resort, you have total peace at the house, and 3 miles away you're at the Lake with shops, restaurants, nightlife, and an array of activities. Tahoe City is the city to be in on the North Shore. With Alpine Meadows, Squaw Valley, and Homewood at your doorstep, you won't be able to ski a run twice. The winter months is a haven for skiing, snow boarding snow snowmobiling. cross county skiing, and with its backdrop the Lake.. you can't beat the experience. Summer is as good as the winter. The Truckee River opens its doors to the melting snow which offers a nice river for rafting. You can pick up your raft in Tahoe City and cruise down to River Ranch. Its mild enough for the whole family. At River Ranch there is a large outdoor deck with BBQ, outdoor bars, and a great spot to watch the rafters come it. Raft 1 day, bike another. You can access the bike path from the house that will meander along the Truckee River to Truckee. River Ranch is a 1/3 way point. Tahoe City boasts Commons Beach, but some of the best beaches on the Lake are found on the West Shore. Meeks Bay has a beach that will remind you of being in a cove somewhere in Hawaii but with mountains. Pristine, crystal clear blue water, white sand beach, smell of tall pines, views of mountains. Its a wonderful setting for a picnic. Chambers Landing is known for the long pier/dock with bar and restaurant at the end of it. This is where all the great wooden boats eventually stop at for a refreshment. The beach is beautiful here, and the entertainment remember able. Can't beat the lakefront restaurants. West Shore Cafe has dining on their pier, with large deck, outdoor bars, and incredible food. 3 miles from the house is Sunnyside Resort with outdoor deck, boat rentals, pier and definitely an afternoon libation. You'll find a multitude of lake front venues in downtown Tahoe City. Lake Tahoe is truly a special place, and this is a special house to enjoy it in. I have great discounted rates for a 7 night stay that don't show up on the calendar. For a quote with the discount, add a 7 night time frame to the calendar.